The outspoken AIDS and Human Rights activists Hu Jia (胡佳) had been arrested a couple of days ago. It is not immediately known what had triggered this action, although his activities on the internet has always put himself in such a danger. His wife Zeng Jinyan (曾金燕) and their daughter of only several months old are under virtual house arrest. Below is the form letter issued to Zeng Jinyan, by the Beijing Public Security Bureau, informing her of her husband's arrest. 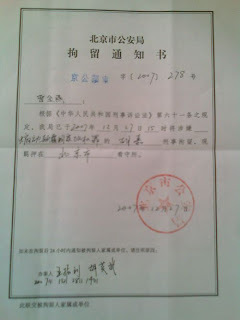 It simply said that "According to Article 61 of the Criminal Prosecution Law of the People's Republic of China, our Bureau has arrested Hu Jia on December 27, 2007 for suspicion of the crime of instigating overthrowing the government."